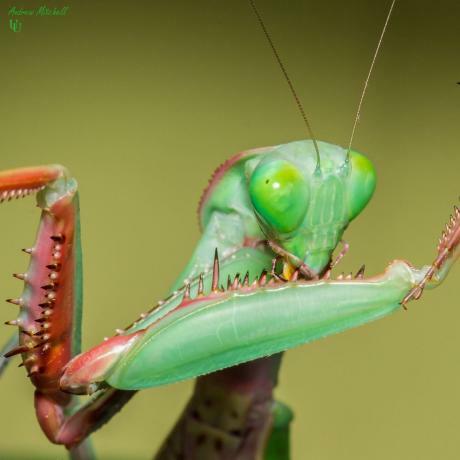 The Giant Rainforest or King Mantis is Australia's largest praying mantis species. They reach impressive adult sizes and are ideal for novice keepers. What does the Giant Rainforest Mantis look like? A large species of mantis with adult females reaching sizes as large as 10cm. They have a bright green base colouration with rusty red inner front arms and purple on the underside of the prothorax. Where are Giant Rainforest Mantis from? These mantids are found in tropical regions of northern Australia. How do you keep Giant Rainforest Mantis? Housing requirements depend on the individual mantis and its size. As a rule, small nymphs can be kept and reared in 32oz plastic pots or other suitable containers, while larger individuals can be housed in one of our praying mantis kits. One of the most important things to consider here is ventilation and allowing the air to circulate. Commonly netting is used over smaller pots or gauze over larger ones. 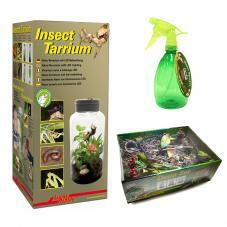 If you decide to use a plastic faunarium, then you don’t need to worry as they have lots of ventilation in the lid. These mantids come from a hot and humid environment, temperatures should be maintained between 24-28°C year-round and at humidity levels of 70-80%. Like most mantis species they are quite tolerant of being kept at normal household temperatures with no additional heating, if kept out of direct sunlight or cold drafts. To maintain a good level of humidity, mist the side of the enclosure and décor items every other day with a hand sprayer. 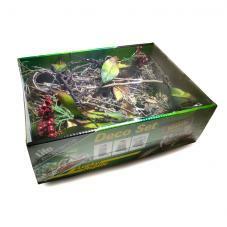 Décor and substrate is a personal choice. You can use something as simple as a trailing piece of tissue down the side of the pot for them to climb on, or be creative and add lots of twigs, branches, live or artificial plants. Peat based substrates and mosses are commonly used on the floor of the enclosure and will obviously help with maintaining relative humidity. Until nymphs reach 3rd instar they are best reared and maintained on fruit flies two to three times a week. 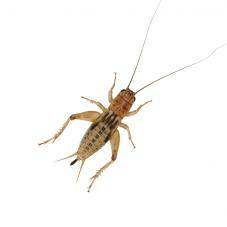 From 4th instar onward, feed them on a variety of suitably sized Curly-wing flies, Crickets and Locusts twice weekly. If the mantis refuses to feed, it may be getting close to a moult. Remove all food items from the enclosure, and ensure they can hang uninterrupted beneath a leaf or branch so they can moult successfully.